Villa Casa Sunshine is a spectacular ocean front luxury estate for rent in Guana Bay. Escape from the ordinary on your next trip to St. Maarten! Treat yourself and get away from it all at a true world class property! You will be rewarded by a wonderful relaxing, peaceful vacation experience at Casa Sunshine that rises distinctively above many other luxury island getaways. This gorgeous 10 bedroom estate is extra ordinary in all aspects: location, quality, style, and most of all, the stunning panoramic ocean front location. The spacious layout of Villa Casa Sunshine gives all parties the room & privacy needed for the ultimate vacation. Fantastic views from the immense ocean facing windows, give you that refreshing tropical island ambiance. There are two separate living areas to spread out & relax, and the spectacular dining area has seating for twelve plus. Have fun preparing meals in this spacious open-concept kitchen, with top quality appliances. And when your day is done, you can retreat to one of the ten beautiful bedrooms with king sized beds and each with it's own en-suite bath! Truly unique and exquisitely designed, this Villa is one of the most beautiful rentals on the island. The estate is located on a gated two acre private parcel with exclusive frontage on Guana Bay. 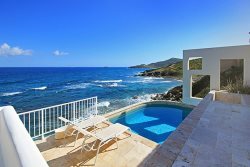 This amazing property offers two Swimming Pools with a spectacular view of the ocean, along with breathtaking vistas from seven of the suites. With over 10,000 sq. feet of space, Villa Casa Sunshine has enough room to accommodate all types of group, family, or couples vacation bookings. *Please note one full week minimum for holiday weeks (Christmas and New Years). Five (5) night minimum otherwise.